Nevada’s offense is centered around the Pistol formation, which is a hybrid Ace-Shotgun formation. In a traditional shotgun formation the quarterback lines up seven yards behind the center with the running back to his right or left. In the pistol, the quarterback lines up only three to four yards behind the center with the running back directly behind him. The pistol allows the quarterback to read the defense more effectively than if he were at the line of scrimmage, and it allows for handoffs to be made closer to the line of scrimmage than handoffs made in a shotgun set. With all the read options and play action passes, success in the pistol offense relies heavily on having an experienced quarterback at the helm. Nevada’s quarterback is a redshirt sophomore and received the award for ‘Best High School Football Player’ in the state of California his senior year in high school. He started nine games last season in which he threw for 1,700/6 yards/TDs and rushed for 694/11 yards/TDs. However, Nevada’s offense is only returning three offensive starters from last year. Look for them to run early and run often. USF’s defense will have its hands full with the pistol offense. Nevada ranked 8th last year in rushing offense with almost 300 yards per game. So the Bulls can expect a heavy dose of the run on Saturday. However, USF ranked a respectable 15th last year in run defense, and USF is returning seven defensive starters. The fate of USF’s defense against the pistol will rest squarely on the shoulders of Fidel Montgomery and Kayvon Webster. The two starting corners will be forced into man coverage with little to no help over the top as the Bulls load the box to stop the run. If USF can neutralize the run early by getting good penetration from the defensive line, it will force Nevada to go to the air. 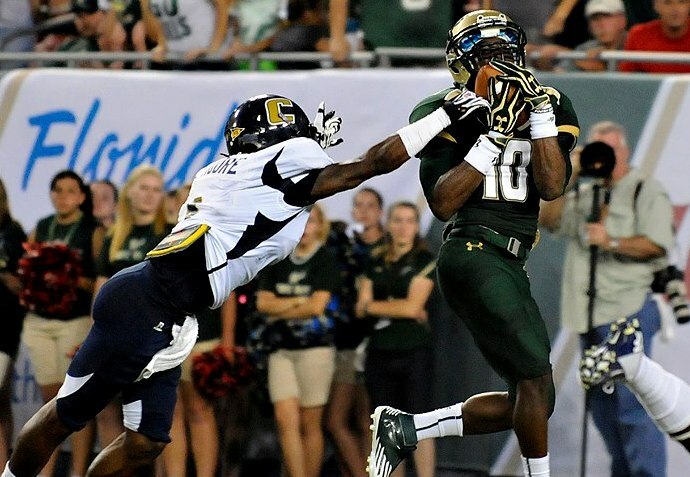 If Nevada goes to the air, USF’s secondary needs to be ready capitalize. Nevada’s defense isn’t known to be anything but mediocre. They finished in the middle of the pack in all defensive categories last year. They look to be pretty solid in the secondary with 4 senior starters returning, including leading tackler Duke Williams. However, the Wolfpack’s defensive line is not returning any starters from last year, and no prospect of any talented pass rushers. Expect Nevada to counter this with a lot of linebacker blitzes and zone coverage, which will leave them vulnerable either in the middle of the field or deep. USF is returning eight starters on offense including senior quarterback BJ Daniels. USF’s offense struggled to get the running game going against a subpar opponent last week, and it doesn’t look promising this week against the Wolfpack’s experienced linebacker/safety combination. With Nevada’s dismal pass rush, I expect BJ to have plenty of time to throw in the pocket. The only way Nevada will get pressure on the quarterback is by blitzing. If Nevada decides to blitz with 2 or 3 deep coverage, look for Evan Landi and Andre Davis to become the favored targets over the middle. If Nevada decides to blitz 1 or no deep coverage, expect speedster Terrance Mitchell to beat his man deep. USF has so much depth at the wide receiver position, and that is how they are going to win this game. My prediction is 24-17 and USF goes home with the victory. I’m excited to see what Lindsey Lamar can do. There always seems to be hype behind certain players, yet we never see them get game time. Hopefully that extra 20-25 pounds helps.